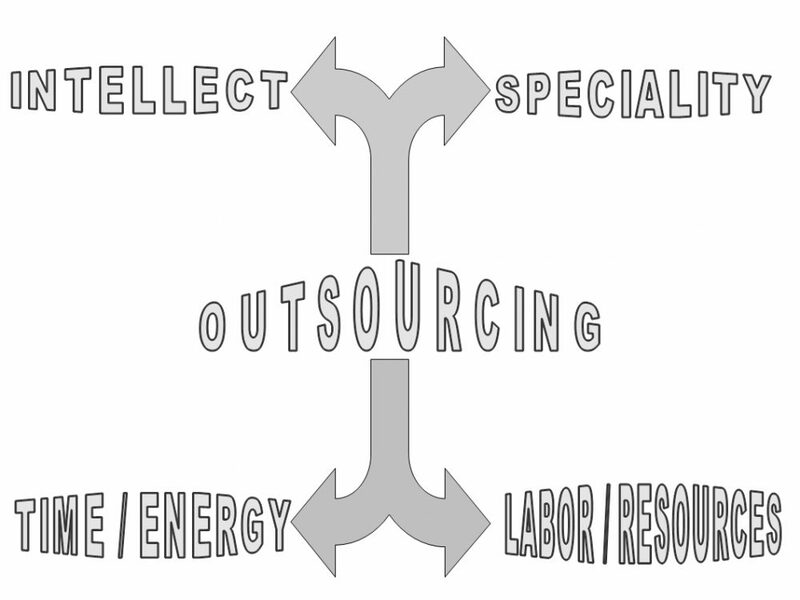 Which Way Are You Outsourcing? Over at MBA Briefs, David’s hard at work honing the site’s focus. An interesting guy with a military & business background, he sent me a quick note mentioning how he plans to look more at personal finance as a business. I really liked the idea, and have been thinking about how many lessons could be taken from successful organizations. One of his more recent articles, David explores the idea of “outsourcing” our personal lives in an effort to show that doing everything ourselves isn’t always in our best interest. Well, I agree… but to an extent. Ever since reading that article, I’ve been thinking about what we outsource. Then it hit me. It depends on WHAT you are outsourcing. Outsourcing can mean a lot of things. Pictures are worth a thousand words, so I made a diagram to visually explain what I’m getting at. Referring to the items above the center as “UPsourcing” and the items below as “DOWNsourcing”, we’ll start from the top and work our way through the chart. For as hard as we try, it’s impossible to know everything about everything. When unique situations come along, we look to “specialists” for help. A specialist can be anything really: HVAC technician, computer help desk, estate lawyer, or ear-nose-throat doctor to name a few. They are expected to possess a wide array of knowledge on very narrow topics. Which ties right into the next item, INTELLECT. Even for what we do know, we still have to rely on others’ expertise at times to guide us. For as similar as these characteristics are, I separated them for a very specific reason. Deferring to a SPECIALIST could be considered ALWAYS worth upsourcing. Replacing your home’s heating/cooling system or preparing your family’s estate plan are both things best left to the experts. There’s too much at stake, any errors will be costly, and any reward/savings on your time and money will be minimal. Much like the graph’s utilitarian color, INTELLECT is more of a gray area. As demonstrated above, upsourcing your intellect would be a good idea. But where do you draw the line? I recently taught my friend how to change his own oil. Once we got situated (getting the tools, buying the oil, etc), we finished the entire job in less than 10 minutes. What got me excited was his comment, “I never realized how easy this was”. He may choose to outsource this task in the future, but it won’t be due to a lack of INTELLECT. This is where the differentiation becomes important – are you upsourcing because of a highly-specialized field, lack of time, or out of ignorance? Sometimes the opposite is true – we have the knowledge, but don’t have the LABOR or RESOURCES. Another example of something which should almost ALWAYS be outsourced, but this time, its downsourcing. How many people have their own boom lift? Guessing not many, and some probably had to look up the term. It’s that retracting bucket tree services use to reach high-up branches. While cutting limbs is a relatively simple task, no one is going to buy expensive equipment for something they’ll use once a year, if that. Now take the LABOR portion. Dentists “outsource” their routine cleanings by hiring hygienists. The dentist could easily perform the work personally, but they wouldn’t be able to see nearly as many patients in a day if they did that. Aren’t we all in this predicament? Trying to be 10 different people in 10 different places at once, we’re constantly being drained of ENERGY and TIME. For as hard as I try, I can’t seem to squeeze 25 hours out of a day. Here’s were the next form of downsourcing comes in. Many of our daily tasks are flat-out mundane and draining. Doing the dishes, walking the dog, and mowing the lawn are the classic examples. The tasks are simple enough to self-perform, but why want not outsource? Because much like with INTELLECT, it depends on what you’re doing with that regained ENERGY and TIME. True story, a family member’s neighbor hired this guy to mow their lawn. They outsourced the work to him, and he in turn outsourced the work to physics. Fairly clever, he tethered the mower handle to a steel pole. The mower would cut the lawn in circles as the rope wrapped around the pole. You’d think he’d use the extra time between pole relocations to trim the hedges, but you wouldn’t believe it – he stood there and watched. When used effectively, outsourcing can be an extremely helpful tool. In order to be effective, make sure to understand WHICH WAY you are outsourcing. So are you UPsourcing and DOWNsourcing? Any sourcing costs money. Unless the money going out can bring more money in, it’s hard to justify. Certainly there are times where we have no choice. But where there is a will there is a way. Trees were trimmed before boom buckets and estate planning could be done without an attorney. .-= LeanLifeCoach´s last blog ..Money & Time, How We Waste It =-. You’re right – “where there is a will, there is a way”. It goes back to the post I did on “convenience” tax. Outsourcing is something that I need to look at more closely. I’m probably going to get some help redoing my website because I am weak in this area. I think the key thing is what do we do with the ‘saved’ time. Are we increasing our value by doing this or not? A very thought provoking post! Great job! @ Ken. It took me about a full month in between purchasing the domain and my first “public” post to get caught up on the website side of things. I think that some of that time could have been saved by outsourcing portions of it. 1.) Make it wider. Too narrow & long right now. Think of the screen as your reader’s eyes – you’re only filling about 60% of it. Plus, it seems the more scrolling the less interested you become. 2.) Edit the falling bills to make it more transparent or remove it completely. Distracting and removes focus from posts. I think you are right on here. There have been times in my life when I paid someone to clean my house. This freed me to work overtime and still have a clean house. It also resulted in a net gain financially. But it would be stupid to pay someone to clean my house when I have time to do it myself and it wouldn’t result in a financial gain. .-= Tracy´s last blog ..Eco Fraud Friday: Energy, Food, Water =-. @ Tracy. Good to hear you had such a clear example. If it’s a net financial gain, why wouldn’t you pursue it? Defining the boundaries (in anything really – saving, investing, working, etc) always becomes the difficult task.